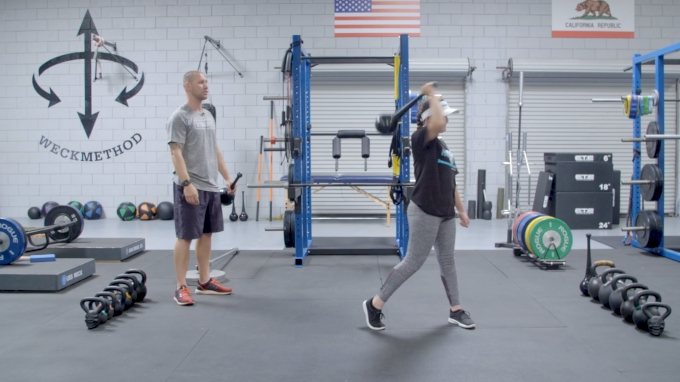 Dana Sorensen and Jono Green demonstrate nearly 40 foundational exercises for pitchers to develop strength, mobility, and stability they need to compete on the field. The Symbiotic Program is broken down into 3, 3-week programs. Each program has two workouts a week for that 3-week cycle. All 9 weeks will feature various breathing exercises that start simple and move to complex. Breathing is a big priority for our program since the diaphragm is a very important core muscle that helps control posture and alignment in the spine and ribs. The first 3-week cycle is designed to focus on teaching foundational movement patterns that will be used in more complex lifts in the next cycles. The emphasis on these first weeks is to learn how to hinge the hips, activate the glutes, activate the anterior core, find rotary stability, learn scapular rhythm, and work on gaining some mobility in ankles, thoracic spine, and shoulders. Overall these 3 weeks will focus on stabilizing and controlling sagittal plane and frontal plane movements. This 3-week cycle is great for both in season and off-season training. It can be performed by any level athlete and repeated multiple times a week. To reduce the risk of injury, before beginning this or any exercise program, please consult a healthcare provider for appropriate exercise prescription and safety precautions. The exercise instruction and advice presented are in no way intended as a substitute for medical consultation. Don't have access to an RMT Club? Pick up one at WeckMethod.